Baby carrier and camouflage umbrella - you saw it here first! Things have been quiet around here for a while. Actually, that isn’t quite true. I haven’t been out much lately, but things have been busy at home. Having a small baby takes up a lot of time, but things are starting to ease up a little. I’ve also been busy with DIY in the house. In particular I’ve been restoring our living room door. This may not sound like a big task, but it’s turned into one. I thought the door was a fairly naff 1970s one that looked out of place in a 140 year old house. After some investigation it turns out that it was the original plank-built door that dates back to the building of the house in 1868, but the previous owners had stuck on plywood on both sides to make it look like a 1970s one. A major campaign of reconstruction and painting, and it’s now back in its proper place – blocking the huge draft into the living room. The practical upshot of all this is that we can now turn on the heating in the room, so at least we’re a bit warmer. The other thing that has kept me indoors is the weather. Like most people we’ve had a lot of heavy rain. I don’t mind rain too much myself, but it makes it almost impossible to go for a walk with Scarlett. In her baby carrier she’s exposed to the elements. I can keep her warm with fleece suits, but I can’t keep her dry. I don’t think they make gore-tex baby suits yet. But I think I’ve found the answer. Being a proper English gentleman I have taken to walking about the countryside with an umbrella. But not just any umbrella. I’ve found an American one in Mossy Oak camouflage. OK. So this is probably totally unnecessary. Having a camouflage umbrella is taking the whole ‘blending into the background’ thing a little bit too far. Who cares – I like it. And when you think about it, perhaps it isn’t such a daft idea after all. I like to think that it isn’t so much an umbrella as a portable hide or blind. 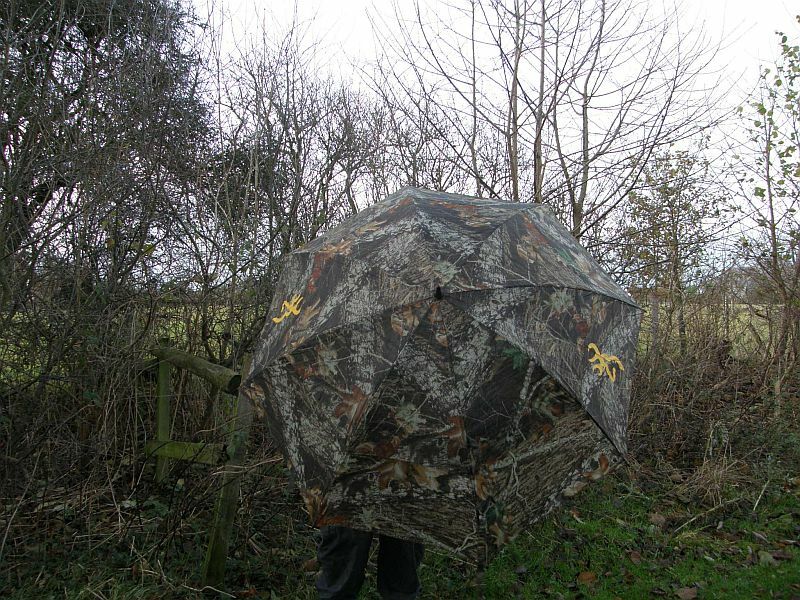 If ever I need to get out of sight of the wildlife, all I need to do is to pop up the umbrella and hide behind it – hey presto – virtually an invisibility cloak! Whatever. It means I’ve got more chance of getting outside with my daughter over the winter, and that’s the important thing. That first pic is quite a surreal image. 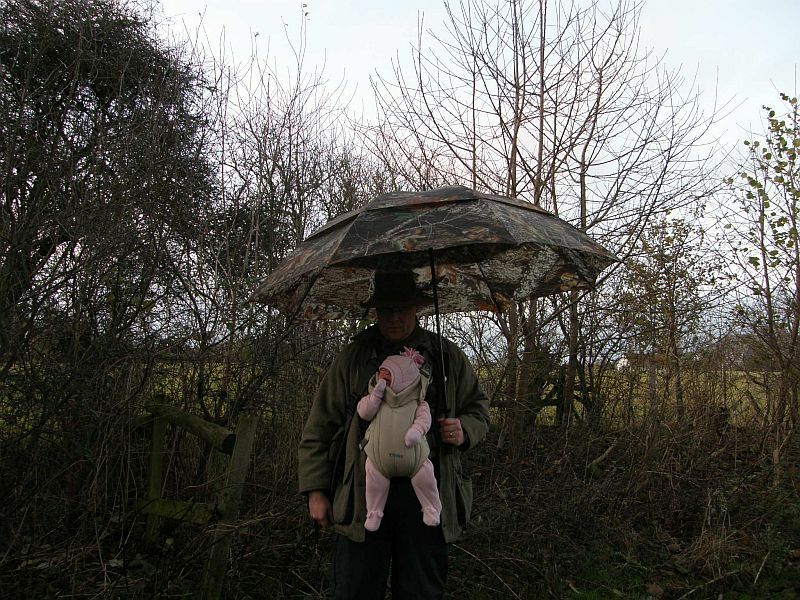 A large camouflaged umbrella and a baby dangling from your torso in a pink jump suit! Well… it made me titter. Great pictures and stories from Namibia, by the way. It looks absolutely fantastic. I’ll be having a proper read as soon as I get the time to do them justice. If you can’t get a camouflage suit, couldn’t you get a badger suit for the baby? Something that would blend in a bit more than pink? And it would look quite cute – black and white stripes, little black ears on the hood, that sort of thing. I could have done with that a few weeks ago. I was culling Red Deer in the South lakes at the peak of the rainfall and floods. I have good waterproof gear but I was soaked through within an hour on the heaviest day. That would have kept me dry for sure. Though I may have been shot by my colleagues for looking daft. Great idea about useing it for a blind.